In the past twenty-some years, trainers and behaviorists have been pushing the importance of early puppy socialization – starting before puppies are finished their puppy shots. This has done a huge amount of good for the average puppy – more people are aware that puppy class and socialization are part of owning a baby puppy. Early socialization IS crucial, but this push has brought with it other myths and misunderstandings about what socialization is; how to go about it; and what it can and cannot do. So, let’s do some myth-busting! 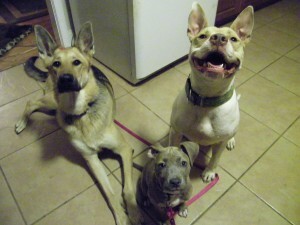 Practicing obedience behaviors near other dogs is a great skill to have! MYTH. Although it is possible that better socialization would have helped, many (dare I say, most?) fear and aggression issues stem from genetics. Unless you are dealing with a puppy who was severely abused and neglected in it’s early life, it’s quite possible that they would show some fear no matter how well they were socialized. Does this mean socialization isn’t important? Of course not! If your dog is by nature fearful, you can make huge strides by socializing correctly and doing some early behavioral intervention. You will not change who your dog IS, the same as you can’t make an introverted person into an extrovert – but you can teach them coping skills. With practice they will be able to function – even thrive – in previously scary social situations. It is important that your puppy meet many friendly adult dogs, not just other puppies. MYTH. Like most things, quality trumps quantity. Let’s say you have a mildly fearful pup, so you figure taking him everywhere and socializing the heck out of him will “fix” it. However, if you’re not socializing him correctly, and instead throwing him into a bunch of scary situations without teaching him how to cope with them, what does that teach him? That yes, the world is indeed scary, and there’s no way to avoid it! In fact, you can turn a little fear into a big fear or even an aggression problem by forcing a dog to “face” the scary thing. Again, I am not saying don’t socialize! 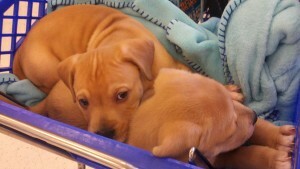 But you need to go at the pup’s own pace, and build his confidence by rewarding him for good choices. When in doubt, simply give your puppy treats and praise for being in the presence of something new and/or scary without encouraging interaction. As with anything, if you’re not sure how to proceed, please find a trainer who can coach you through it! 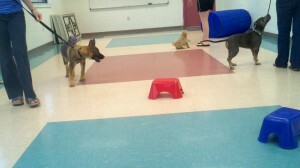 Puppy class should include weird objects such as noisy children’s toys and agility tunnels. MYTH. Ok, yes, quality trumps quantity … but your pups still need to be able to generalize the concepts. That means they do need to have positive experiences with dozens of different dogs and people, of all shapes, sizes, ages, and colors. Otherwise, you may find that your puppy is very well socialized to yellow Labradors and middle-aged Caucasian women, but have no idea what a Pug is and are terrified of young darker skinned men! MYTH. While it’s true that you cannot technically socialize a puppy who is older than 18 weeks, that doesn’t mean your job is finished. Think of their continued social experiences as a muscle that needs exercising. If your puppy meets many other dogs in puppy class, yet spends the next 2 years of his life in your back yard, his dog skills will be rusty or non-existent! For an adolescent or adult dog, it’s not only important to continue having positive experiences, but also to practice appropriate behaviors in different environments – such as sitting to be petted, or recalling out of play with other dogs. These might seem more like training than socializing, but they are still exercising that social muscle. 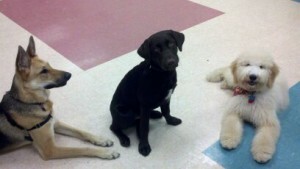 CLA offers off-leash puppy socialization classes in Westminster, MD. Please feel free to email us to find an appropriate puppy class near you!